Wash the oranges well. Place the oranges in a medium-sized saucepan, cover with water and bring to a boil. Once the water is boiling, cover the pot and let simmer for 1 1/2 to 2 hours. Remove from heat, drain the oranges and allow to cool. Remove any bits of stem from the oranges. Toss the oranges in a blender, skins and all, and blend until smooth. If you see any bits of seed, remove them from the puree. Measure out 2 cups of puree and set aside. Preheat the oven to 375 degrees. Butter and flour an 8-inch round cake pan with 2 inch tall sides. Line the bottom with parchment paper. In a medium-sized mixing bowl, whisk together the eggs and sugar until the sugar dissolves. In a separate bowl, whisk together the almond meal, baking powder, and salt. Add the orange mixture to the egg mixture and whisk. Add the almond meal mixture and mix until combined. Pour batter into prepared cake pan. 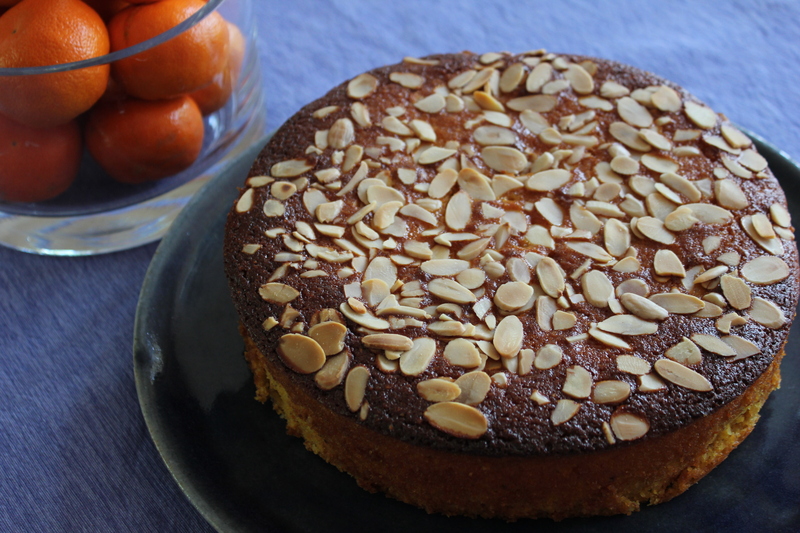 Scatter the top of cake with the sliced almonds. Slide pan into oven and bake for 60- 70 minutes or until a skewer inserted into the center comes out clean. If the top of the cake becomes too brown, cut strips of foil and wrap around the edge of the cake. Allow the cake to cool for ten minutes in the pan on a wire rack. Slide a knife around the edge of the pan to loosen the cake, then remove cake from pan and peel the parchment off the bottom. Return cake to the wire rack, almond side up, and allow to cool completely. Once cool, dust the top with powdered sugar and serve. I cannot wait to try this! Thanks so much, Karen. You are welcome, Crystal. I hope you enjoy it! This sounds wonderful. A perfect go-to cake. It is so easy too! Oh wow! This looks absolutely delicious! I am definitely going to try this. Our dear friend Annalyce makes a similar cake all the time. I prefer it to the traditional chocolate flourless. Can’t wait to try your version, Karen. I have a hard time turning down chocolate anything, but I have to admit I would choose this cake too! A lovely cake, Karen! I love baking with almond meal and this sounds scrumptious.